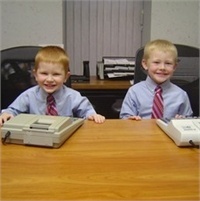 Chase and Brayden love coming to the office. When Chase was six he even announced which office would be his some day. When asked where grandma would work his response was, "she doesn't need an office, she can just watch us work."